Hallasan is one of Korea's three most sacred mountains, located on the southernmost island of the Korean Peninsula. It rises 1,950m above sea level, making it the tallest mountain in South Korea. If you're expert to climb, I recommend Mt. Halla for ONE DAY. You can go to peak via two courses i.e. Seongpanak and Gwaneumsa. Most of people choose Seonpanak to go up peak and down to Gwaneumsa. If you have very short time, you can choose Yeongsil course too. It's the course you can get to the top of Mt.Halla but it's kind of boring. The slope is gentle so even children can climb up easily. From the top, it's possible to come downhill to Seongpanak or Gwaneumsa. If you get there before the time, you have to depart at least before 9AM from Seongpanak Rest Area. From Jeju Local Bus Terminal, take a bus on the bus route of "5.16 Road" and get off at Seongpanak Rest Area. For the last 20minutes, it's so hard to trek. In winter, you must prepare climbing irons(crampons). At Seongpanak Rest Area Booth, you can buy several kinds of things to eat and drink. At Chindalrae Shelter, you can buy and have cup noodle and coffee. The trail is composed of rocks so you should put on trek shoes or mountain-climbing boots. It is the best course departing from Gwaneumsa and finishing at Seongpanak. The valley is deep and the geographical features of the mountain is magnificent so you can see its true colors. But the course is rather difficult that's because the trail slopes. From the top, you can go downhill to Gwaneumsa or Seongpanak. From the start till the one-third point, Tamna Valley, the trail is gentle but, after that it slopes. 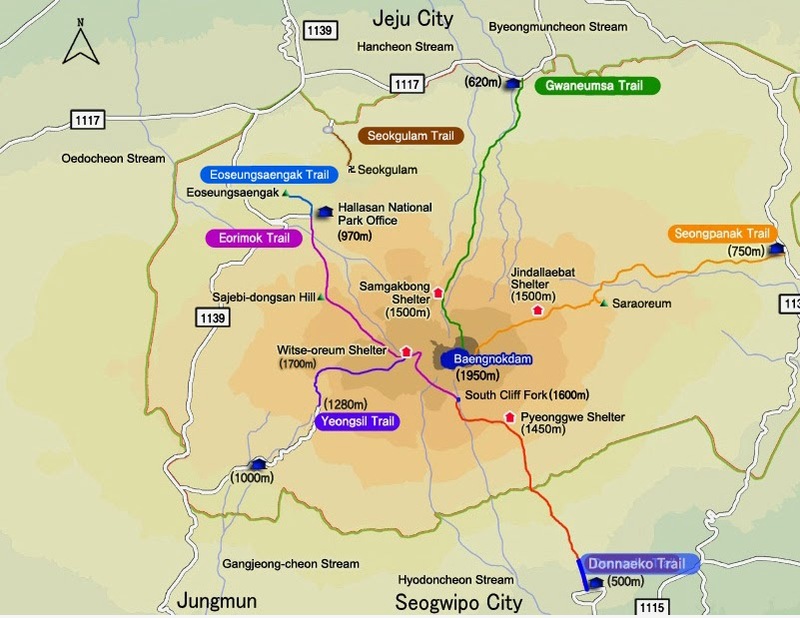 You can enjoy spectacular sceneries while trekking such as Guringul, Samgakbong, Yongjingak and Wanggwanneung. From Yongjingak to the top, the altitude gap is over 300m that's why it's very hard to trek. At Gwaneumsa campsite Booth, you can buy several kinds of things to eat and drink such as gimbap and chocolate bar. The trail is almost composed of rocks so you should put on trek shoes or mountain-climbing boots. Be sure to prepare enough water and snack. It is the shortest climbing route. The outstanding scenery of Youngsil Giam Rocks listed itself as one of the ten most bequtiful scenic views of Yeongju. The red leaf of maple trees boasts the most incredible grandeur in October. People can climb up to the shelter of Witsaeoreum situated in the highland 1,700 meters high above the sea level since the Rest-year Sabbatical System had been promulgated in July, 1994. The distance is 3.7 km, taking an hour and thirty minutes for one way trip. The distance from the ticket office to the entrance of the mountain is approximately 2.4 km, taking 45 minutes on foot. You can climb down thorough Eorimok as well. Take a bus to Jungmoon(1100Road) at Jeju Bus Terminal, take off at Youngsil ticket office. You can see one of the most scenic areas in Mt.Halla after passing from the first entrance to the midway point. You can buy some food and drink at Youngsil Resting Place. You can have a cup instant noodle and a coffee at Witsaeoreum Canteen. If you want to trek the short course, you can start from Youngsil and finish at Eorimok. For more information, you can see Tripadvisor's comments and Mt. Halla National Park.